Ammann’s technologically advanced asphalt-related products will be featured at the 2018 World of Asphalt Show & Conference to be held March 6-8 in Houston. The ABP HRT plant is an ideal fit for asphalt manufacturers who need to incorporate large proportions of RAP without sacrificing production capacity and quality. Ammann has had a strong presence in Europe and other parts of the world for nearly 150 years. 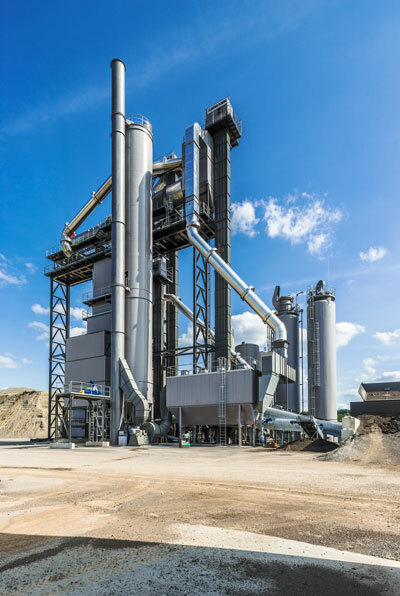 It recently began distribution of asphalt-mixing plants in North America, and brings with it a host of experience, technologies and highly successful products. Three asphalt-related products are drawing much attention in the North American market. The ACM Prime Asphalt-Mixing Plant is perfect for those who have a number of small jobs in varied locations and where frequent transport is required. The first Ammann Universal ABP HRT (High Recycling Technology) Asphalt-Mixing Plant in North America has been installed in Columbus, Ohio. It began producing mix in early December. The ABP HRT plant is an ideal fit for asphalt manufacturers who need to incorporate large proportions of RAP without sacrificing production capacity and quality. The HRT is a “two-in-one” plant featuring both warm and cold recycling systems that can be used simultaneously. There are two warm recycling systems to choose from. One is the conventional concurrent flow dryer for RAP additions of up to 60 percent. The second is Ammann’s latest development in warm recycling, the RAH100, which can utilize 100 percent RAP. The most striking visual difference between the HRT and traditional plants is the vertical stacking of the RAP-bearing components. This configuration reduces wear and sticking and shortens the travel distance of hot RAP material. The plant has a production capacity of 440 U.S. short tons per hour. It can utilize foamed bitumen, pigments and other additives. The Prime also is a great initial acquisition for paving contractors looking to introduce asphalt production into their businesses. The plant excels at specialty mixes, such as those used for paving tennis courts and running tracks. The ACM 140 Prime offers output of up to 154 U.S. short tons per hour. It is engineered for smaller volumes and therefore produces them efficiently, delivering cost savings in fuel and electrical energy consumption. Recycled asphalt can be utilized with this plant. The entire plant and three cold feeder bins fit on two axles during transport. When working, its total length is 71 feet, making it a good fit on production sites where space is tight. The plant’s intuitive control system and interface makes it easy to use. Entering recipes is done with the click of a mouse. A flat screen displays the entire plant and process in a simple view. The RSS 120-M Shredder, Iron Separator and Screener is a mobile machine that prepares RAP for use in an asphalt plant. The shredder’s patented crushing system maintains desired grain sizes, which is important because it dramatically reduces the fines that make RAP sticky and difficult to work with. With its ability to function as a shredder, iron separator and screener, the RSS 120-M is essentially a three-in-one machine. It can go from installation to production in as quickly as 30 minutes. A single operator can run the machine, and the parameters can be adjusted locally or remotely. The RSS 120-M is a fuel efficient, all-weather performer that is able to crush hard materials as well as soft materials, such as clays. It can process about 200 U.S. short tons of recycling materials per hour. A variety of green efforts are built into the machine, including a dust reduction system and minimized sound and emission levels. Routine maintenance is simple, and all parts and components are easily accessible.